We could easily call this, “just too cute”. But that would be a little to sensitive for a hard hearted fella like myself. So, we will call it, blessings of a hill. It was 105, and the sweat was running off my elbows as we climbed yet another little short 8% grade. Not very long, just enough too make you bear down to get over it. We were rolling uphill into another tiny Romanian village. The road was narrow, the nerves, frayed, and the shoulder. Well for the most part, nonexistant. A wooden fence to my right, held me into the lane of traffic it was so close to the road. A couple cows and a pig had the run of the area that the fence boundaried. A huge weeping willow shaded the side of a rather “rustic” little casa, flowers adorned the west wall of the house where paint should have been. 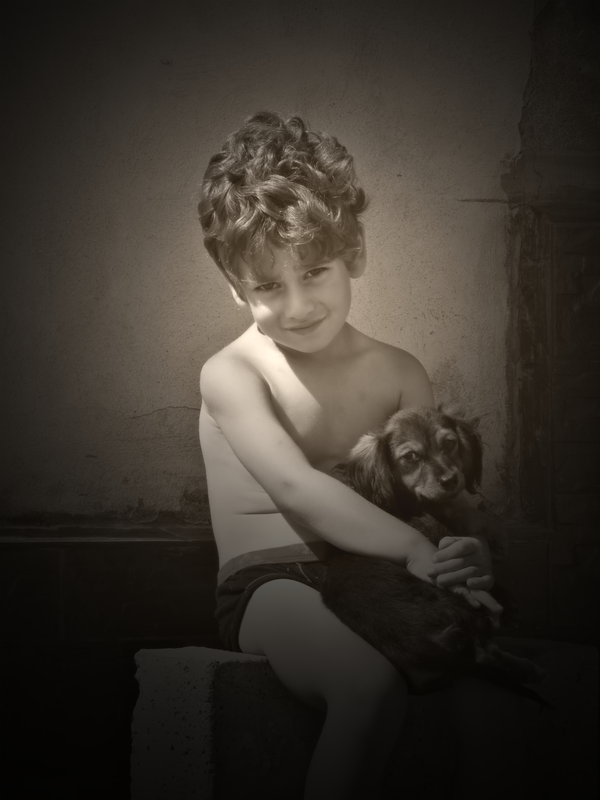 Out front, like an emporor on a throne, sat a small boy, clad in just his underwear, holding a small mongrel puppy. He was mentally on auto-pilot as the sultry afternoon passed him by. Just to cute to pass up. I rolled to a stop, pulled out the camera and snapped a shot thru the rails of the fence. I know he seen me, but I am not at all convinced that we broke or disrupted his train of thought. The way it looked to me, he still expected Sponge Bob Square Pants to be coming from the north, to invade his kingdom, and he was holding onto his only protection till then. The blessings of a hill for sure, I was goung so slow it allowed me to stop without disturbing any one. He is adorable!!!! Classic photo! Howdy to you too dear!! Can hardly wait to see the photo! You know those kids always do catch your eye. Busy back and forth to Paso this week but will try to catch up with you guys. Love Mom!